The Forbes 2012 Fictional 15 places the dragon Smaug from The Hobbit at the top of the heap. But I distrust the analysis of the list since Smaug was only 7th last year at $8.9 billion and now they say it "jumped 16% from last year to $62 billion". But I think the real story here is that some writer got paid actual money to figure out how much pretend money Smaug, Jed Clampett, Batman and Scrooge McDuck might have. I think its the same source as a best/worst job list I mentioned a couple weeks ago but RetireBy40 has linkage to the complete data with 200 jobs ranked. ICantPayMyBill.com has some useful consumer advice if you're in a situation where you are unable to pay a bill. They go into specifics on different kinds of bills and discuss tactics with specific debtors. MyMoneyBlog gives us a List of Cheap, Basic Prepaid Cell Phone Plans – Under $10 a Month! The other day I read this article : Jailed for $280 : The Return of Debtors Prisons. I encourage you to read the article yourself. The short version of the story is that while its illegal to put someone in jail for failing to pay a debt there are however a lot of cases now where people are put in jail because they failed to pay a debt. Of course that makes no sense at all, but its basically what happens. The article shares a story of a woman who got a $280 medical bill in error and was told she didn't have to pay it. Then fast forward and a debt collector has gotten the local sheriffs office to haul the woman off to jail. Of course that makes no sense because debtors prisons are illegal in the U.S.
What is really happening is that courts are fining and imprisoning people for legal actions related to the debt rather than the debt itself. So you aren't going to jail because you failed to pay the $280 bill but you do go to jail because you failed to appear in court for a court hearing related to the $280 bill. In effect the debt collectors can use the power of the courts and threat of jail to get people to pay the bills. The article says that in Illinois it can be common for debt collectors to use the threat of the courts and jails to pressure people who owe even small debts. Part of me says this is fair and that if you don't show up for a court date or ignore a judge order then there should be criminal consequences for that. But really we're talking about a totally civil issue here, not a criminal issue. I don't think we should be using our jails to punish people for ignoring a past due $150 cable bill. "We also profile Gregory White, a homeless man who was arrested for stealing $39 worth of food from a local grocery store. He was assessed $339 in fines and fees, which were later converted into a community service sentence after he was jailed because he could not pay his fines. Mr. White spent a total of 198 days in jail because he was unable to pay his LFOs and could not afford the bus fare to complete his community service. In all, his incarceration cost the City over $3,500." The city spent $3500 to put someone in jail for 198 days because they stole $39 in food and then couldn't pay a $339 fine. Of course theft is wrong and homeless or poor people should not steal. But if a homeless person steals food then fining them isn't a very logical punishment. If he could afford food in the first place, presumably he wouldn't be stealing it and clearly he wouldn't have the money for such a fine. I don't think they should just ignore such crimes but there has to be a better solution. Whether its a unpaid bill or a criminal fine, I don't think it makes much sense to throw people in jail for unpaid bills. Debtors prisons are illegal in the US and so people really shouldn't be jailed for debts. Thats my opinion. What do you think? Should courts jail people for debts? I've talked about fixed annuities on and off in the past. Generally I think that an immediate fixed annuity can be a pretty good way to provide some guaranteed income during retirement. A lot of people are generally wary of annuities. Sometimes people are legitimately worried about high fees or just confused about how annuities work. Most people have an understandable cautious concern about handing over large amounts of their money to an insurance company and thus feel they are losing control of their finances. However I also think a lot of people feel they can simply do better by managing their own money and investing in stocks and/or bonds. "Financial planners sometimes say that a particular favored system may give you a good chance of significantly higher investment returns if your savings are placed in equities or some other favored investment. That may be true. But such homemade systems also carry a risk of running out of income long before one runs out of life. Their sponsors may counter that the risk of such an eventuality, if everything goes according to assumptions and the plan is followed tightly, may be only 15%. That is roughly equivalent to the 16.7% odds of losing in a game of Russian roulette, and few people are prone to participate in such games! Why, then, are people so prone to bet their own income security when it comes to retirement?" What if I told you that you have an 85% chance of outliving your retirement funds if you self managed the money in stock/bond investments. Doesn't seem too bad if you put it that way. The vast majority of time people will do fine. But the opposite of that is the 15% failure rate. Which is quite close to the 1 in 6 chance (16.7%) rate of losing a game of Russian Roulette. Would you take those odds? Of course I'm not saying that buying stocks is analogous to putting a gun to your own head. But its an interesting way to think about the numbers. When the negative consequences of failure are very high then it gives us much more compelling reason to take lower risks and seek a much higher success rate. The consequences of running out of money in your old age are pretty bad if you ask me. Note: The cynical side of me forces me to point out that the study in question is partially funded by an insurance company which makes profit off of selling annuities. Which I think is bad cause peoples natural cynicism in distrusting studies funded by profit seeking companies can can undercut what is a very good retirement strategy. Modern homes are built in more energy efficient ways. New homes usually have better insulation, more energy efficient double pain windows, more efficient furnaces or air conditioners and other energy efficient improvements over older houses. It then only stands to reason that newer homes should be cheaper to heat and cool. Of course newer homes are often larger than older homes so some of that efficiency gets masked by the higher energy costs of a larger home. Therefore the best way to compare the energy efficiency based on age and improved building practices is by the average cost per square foot. I found information on average energy spending per homes from the US Energy Information Administration and they broke it down into the decade the home was built. The numbers are from 2005 which is the most recent covering this information. Interestingly there aren't t major differences in the amount spent on the homes from 1940 to 1979. It seems that the biggest efficiency improvements kicked in after the 1980's. If you were looking at a home built in the 1960's versus one built after 2000 then you could expect to see about a 24% decrease in average energy expenditures. I should point out that this analysis is not perfect since this is just the amount people spent and not necessarily an indication of the different quality of home building per decade. In other words its feasible that people who own older homes are more likely to waste energy or something like that. I haven't proven a cause - effect here. Also the data doesn't take into account other variables such as who owns the homes, where they are built, etc. Its also possible that more of the new homes are built in states with lower energy costs. However I think its pretty reasonable to take national spending averages and then assume that the differences are related to building practices based on building age. It should also be noted that these are just national averages and individual spending will vary greatly in different climates and other factors. Wyoming and Hawaii do a nice job of completing high school. As you can see both states are solid red. Rural areas of the South seem to have the lower completion rates in general. 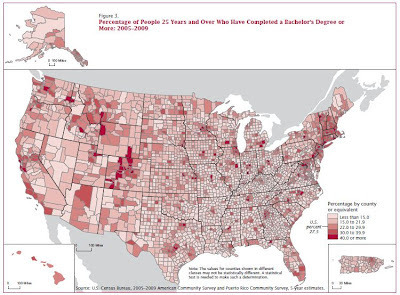 One thing these maps do is highlight the differences between rural and urban areas. You can see red spots focused around locations of major cities. Then there are white spots filling in the many of the rural areas. fivecentnickel answers What Happens if You Contributed Too Much to an IRA? Amazon is offering another $2 free MP3 download credit. It expires at Noon April 22nd. 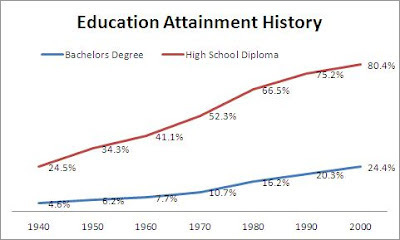 College degrees are getting more common nowadays. However most people do not go to college or obtain a bachelors degree. The numbers have risen considerably over the decades. The Census of course has data on such things over the decades. Clearly over time people are obtaining higher level of education. 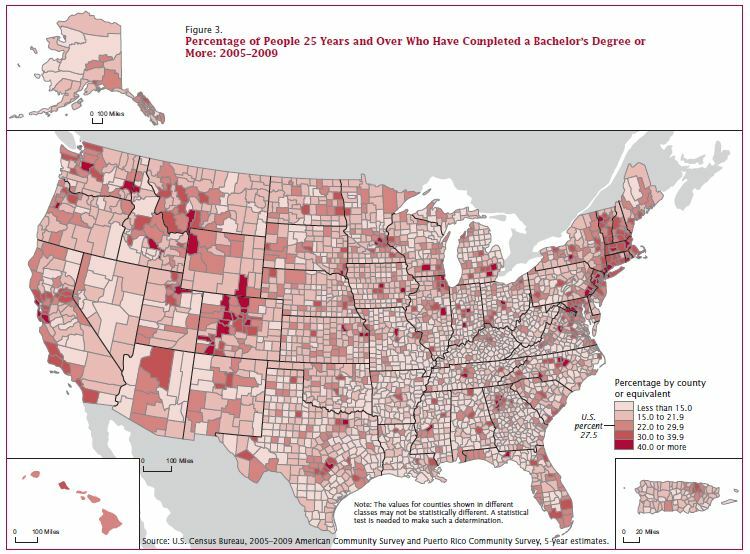 Just about the same % of people in 2000 have Bachelors as the % who had High School diplomas back in 1940. You can see the peak as of 2000 was actually among the people age 50-54. This surprises me a little bit as I was assuming that the % of people with degrees would be lower with age in general. However if you give them a few more years the 20-30 year old group may start to take the lead. The Entertainment.com site says its a "Tax Day Sale!" and the 10.40 price is a play on the 1040 IRS form. I assume this sale price is only good today. You could also wait and see if they get cheaper. I pointed out late last year that the books go on sale in the summer. $10.40 is a pretty good deal and they may not get lower than that. But last year they were as low as 2 for $10. If you aren't familiar with the Entertainment coupon books then I'd recommend you browse their website to check out what kind of deals are available in your city. They often have a lot of good values but you should make sure there are merchants that you'd actually want to buy from. They tend to be mostly buy one get one free variety of coupons. You might hear about the local public university building a new stadium for their football team and wonder why your tax dollars are being spent on sports. One might wonder if athletic spending is contributing to the high inflation of university costs. But do athletic programs really eat up that much of college spending? Does increased athletic budgets at universities account for a significant part of the increases in college costs we've seen in recent decades? Football and Basketball teams often make a profit. When I say they make a profit I mean that the revenue generated from the sports exceeds the expenses. So the teams basically make the school money which can then be used for other things. Many universities see significant profits from these teams. The business of college sports lists Which football and basketball programs produce profits.On the other hand the other sports teams at universities almost always do not generate a profit. When you add the spending on all sports then few universities athletic programs are self sufficient. A USA Today article indicates that only 22 out of 228 public division I universities have athletic programs that actually pay for themselves. Most college athletic programs are subsidized. The USA Today article reports that "Altogether in 2010, about $2 billion in subsidies went to athletics programs at the 218 public schools..." $2 billion sounds like a lot of money but it probably only accounts for 1-2% of total spending at those 218 schools. USA Today also says "Those subsidies grew by an inflation-adjusted 3% in 2010. They have grown by 28% since 2006 and account for $1 of every $3 spent on athletics." University subsidies for their athletic teams are too small of a portion of total university spending to account for the high inflation rate in college costs over the past couple decades. USA Today also has a database that you can look up the revenue and spending line items for specific universities athletic programs. I decided to look into the details for a semi random sample of 10 universities. I picked the 'State' schools and just grabbed the first 10 alphabetically. This is just a small sample of 10 schools so we can't assume this accurately reflects university spending in general. But its just a sample to give us an idea and I think its random enough to be fairly representative. Note: I looked up the university total budgets directly on the websites. With the one exception of Alabama state which I found the number elsewhere. You'll see theres a pretty big difference in subsidizes from one school to the next. On one end you have Florida State which has a subsidy of about $400k for its athletes and a total university budget of over $1 billion so their sports subsidy is just 0.03% of total spending for the school. On the other end Delaware state spends over $11million on its total budget is just $84 million so they spend 13.3% of their money subsidizing their sports programs. Yikes! That amount of spending on sports at Delaware State seems out of control versus their budget so I question if the numbers are correct. The median subsidy of the 10 schools is 0.8% of the total university budget. The Average subsidy is 2.7%. Its not as if the money spent on student athletics is all just money thrown down the drain or wasted. One of the major expense categories for college athletics is the 'athletic student aid'. Thats the money given to students in the form of athletic scholarships and room and board. THis makes some of the schools look a lot better. For example the last school there Illinois State subsidizes their athletic program by $2.4M but $4.5M of the athletic spending expense goes to student aid. If you subtract the student aid portion from the subsidy amount then you could look at that is the university directly subsidizing the athletic students. If the athletic programs were all abolished then many, if not most, of those students would still go to college and most of them would still qualify for some form of financial aid from the university. I won't pretend that all student athletes would end up in college based on their grades, but you can also look at this as a good benefit as athletics serves a purpose to provide a college education opportunity to students who wouldn't otherwise have that chance. Athletic budgets subsidizes by universities generally account for 1-5% of total school spending. For the 10 schools I looked at the average was 2.7% with a range from 0.03% to 13.3%. This expense alone is certainly not enough to account for the high increase in college costs in the past few decades. Much of university athletic spending goes to student athlete aid. A lot of the cost of university or state spending to subsidize athletics is in the form of free tuition for the athletes themselves. Which a lot of people would argue is a good and worthy benefit of college athletics. It seems over the past couple years that high income individuals complaining that they don't have enough money has become a reoccurring theme in the media. Theres been a few notable examples and they often stir up a significant backlash from the public, bloggers and other news outlets who all have a grand time bashing the people for having the gall to whine about only making 10 times as much as most people. Not long ago PK from DQYDJ.net clued me into the term HENRY which stands for High Earners, Not Rich Yet. "A buzzword coined in a 2003 Fortune Magazine article to refer to a segment of families earning between $250,000 and $500,000, but not having much left after taxes, schooling, housing and family costs - not to mention saving for an affluent retirement." HENRY's are more or less the bottom rung of the 1% group. They are high earners but not mega millionaires. Some individuals in this group feel they are down trodden because they get a "rich" people target applied to them but they don't have private jets or the good butlers. They then stupidly take their irrational whining about their supposed financial difficulties to the Internet where they are quickly roasted by the 99%. This is one of the front lines of class warfare. If front lines consisted of a rich moron shoving his foot in his mouth and a million other people pointing out he's a fool. I'm sure the vast majority of HENRYs are sane and nice folks who work hard for their money and have more sense than to whine in public in front of actual poor people about how hard it is to put Jr into the elite prep school while also saving 15% for their retirement, paying the housekeeper AND affording the decent size apartment in the nice area of Manhattan. But in any group theres always a small % of the population which have more Internet access than sense. So we see a small trickle of HENRY's who go out on the web to whine about how tough if is for them to live in their gated community on 'only' middle 6 figure incomes. These are the Whining HENRY's which are a very very small subset of the HENRY's. The WHENRYs fail to realize is that when you have it better than the vast majority of people, very few people will have any sympathy for your complaints about how bad you think you have it. Its like complaining to a starving man that your filet mignon steak was slightly over cooked. Its like complaining to the driver of the 1990 Chevy minivan with mismatched body panels that your 5 hundred series BMW isn't quite as nice as the Mercedes AMG you've had your eye on. Its more or less a 'let them eat cake' kind of mentality. Last year MSN wrote Down and out on $250,000 and did a decent job of examining exactly how 'hard' it is (or isn't) to survive on 5 times as much as most people make. These people may accumulate a lot of expenses that lower income families don't see or realize, so there can be a sliver of truth to the complaints. But mostly those expenses are things like private schools or over priced housing. And the complaints amount to pointing out how theres not much left after you spent it all. Sometimes the argument boils down to just saying "New York City is very expensive". Ok, I get that. Manhattan can be really expensive and hard to afford on even 6 figures but that doesn't really mean you're poor either. Theres also a very big difference between saying "I don't feel rich" and "I feel poor". I think some of the WHENRY's actually mean to say "I don't feel rich" and thats reasonable for them to think that, but they are wrong. The definition of 'rich' is very relative in peoples minds. For someone who has a $9 /hr job and $500 in their checking account, they may look at anything in the 6 figure income range ans 'rich'. Rightfully so I'd think. If you're worrying about whether its ramen or breakfast cereal for dinner tonight since thats all you can afford then someone making $100,000 would certainly seem 'rich' by comparison. But for that person making $100,000 they often don't 'feel rich' and they'd likely put the income bar for 'rich' level higher up closer to $250k or much more. It almost turns into a moving target such that an individual defines 'rich' as 'a lot more than I make'. The HENRY's are in the top 2-3% of income earners. This puts 97-98% of the population below their income level. A large portion of the nation will look at such an income as 'rich' level. The HENRY's themselves will however may not 'feel rich'. Sometimes people get out of touch with the rest of the world and people often have skewed or biased views of things. If you travel in a circle of people who are doing well financially then its harder to see just how hard most of the people actually have it. This is when the WHENRY's make the "let them eat cake" kind of statement of declaring that they aren't rich but are in reality really poor just like all you actual poor people. Some of the WHENRY whines comes from their dislike of taxes. One of the most well known examples of such a WHENRY was Todd Henderson. He infamously posted on his blog (later deleted) about how he is downtrodden and can't afford a tax hike and how the world will end if he has to fire his household servants. Here's an article that discusses his article and has some quotes. His foot-in-mouth moment was basically a idiots misguided way of saying that he didn't want to pay more taxes. Few people really enjoy a tax hike, so I can understand that basic sentiment. But dislike of taxes doesn't rationalize pretending you're 'poor' or 'barely making it' when you have enough money for a multitude of luxuries and still mismanage or simply squander large sums. Taxes don't make you poor. Sometimes the WHENRY isn't a WHENRY at all and is just a misquoted HENRY. The misquotes are made by the media in an attempt to get another sensational article that 99% of the readers can love to hate. I think this is what happened recently with the example of Andrew Schiff. I talked about Schiffs case not long ago. When you read his actual quotes he wasn't saying he felt poor nor whining about not being able to make ends meet, yet that is the picture the writer seemed to paint. WHENRY's often display a lack of understanding about what 'make ends meet' really means. They will declare all their expenses and also list their retirement savings and their savings and then say they are struggling. If you can do things like save for retirement, pay for your kids tuition and still have money left over after you buy yourself various luxury services then you are certainly making ends meet. Failing to 'make ends meet' means you can't pay your bills, can't save or invest excess money and generally means you pile up debt spending just to subsist. The WHENRY's are almost always the opposite and have excess discretionary money for luxuries, carry little debt other than a mortgage and almost always save for retirement and invest on the side. Recently a commenter in a FMF article said that most students who enter college at age 18 do not graduate in four years. This is in fact true. However I remembered over 2 years ago I talked about reading an article in the WSJ that said that only 60% of students graduate in 6 years and they cited the Dept. of Education. The difference is that while many students don't graduate in 4 years they do manage to graduate a little later in 5 or 6 years. I decided to look up the actual data at the Dept. of Ed. fast facts QA item on college degree completion. They say : "Approximately 57 percent of first-time students who sought a bachelor's degree or its equivalent and enrolled at a 4-year institution full time in fall 2002 completed a bachelor's degree or its equivalent at that institution within 6 years." Thats the 6 year rate. If you look at their Table 341 data they break down rates for 4, 5 and 6 year periods. Thats for all students across four year institutions. What happens to the rest of the students? Some drop out, some are still working on degrees and some decide to stop after getting an associates degree. THe Dept. of Ed. info also breaks up degree completion percent numbers by a variety of student and institution characteristics in the Table 343 That table gives more specifics on the status of students at the 6 year point. 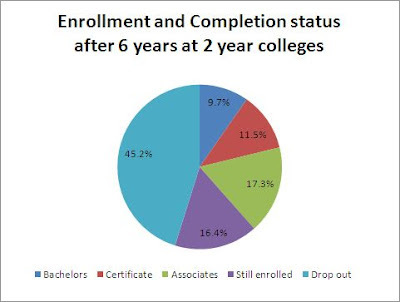 Note that the 'other degree' group is for 2.7% of students who got a certificate and 4% who settled for an Associates which may or may not have been their original goal. 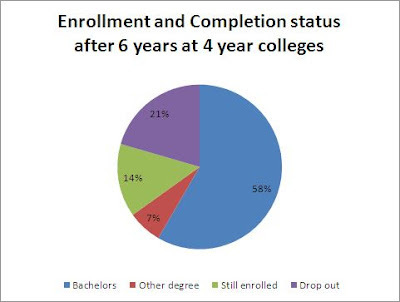 Degree completion varies by a lot of factors. I'm going to take a guess that there is large correlation between the students that work full time and the students who attend school part time. Those two groups have higher drop out rates. I'd also then guess that the bigger reason they drop out more is that they are working full time and taking college part time and that amount of work is challenging to sustain long term. Of course this is really just speculation on my part but I think its likely. The numbers given above are all for 4 year colleges and all look at the students as of 6 years after they start college. They don't track the students after 6 years so its possible more of then graduated after 7 or 8 years or more. Most of the things listed above are not something you can change. But there are a few things you do have direct control over. It appears that if you start college right out of high school at age 18, if you do not work during college, if you take full time class course load and if you attend a private non-profit college that these may all contribute to higher graduation rates. However theres no indication of causality here. So we don't know if these things really help you graduate faster or if its just coincidence. I mean its possible that the only thing that really matters is how educated your parents are. Then it might follow that the other factors correlate to educated parents. More educated parents would have more money and more likely to allow a student to afford a full time private school without working. It seems to make sense to me that working could cause lower graduation rates. Working and going to school is harder than just taking classes so it should be easier to graduate if you don't have to work or if you work less. Table 343 also breaks down the percentages for 2 year schools based on different characteristics. Donna at GetRichSlowly says Why It’s Okay to Buy a Mega Millions Ticket (Even After You’ve Done the Math) which is an opinion I've voiced in the past myself. This infographic was right up my alley. I had to make the image a little smaller to fit my page. You can find the full size original image here. When you start out in life after school it is pretty common to have an apartment. 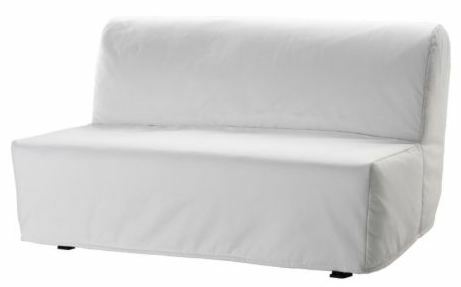 In order to furnish that apartment you may very well need to buy a fair amount of furniture. Most people, I'd assume, leave their parents homes with little furniture other than a bed typically. Personally I'm of the opinion that when you first set out on your own that you should keep your household furnishing spending on the cheap side. This is often necessitated by the cost, its not as if most people can afford a lot of expensive stuff with the wages from their first job. However you may start with a reasonably good salary and have enough money to spend on nicer stuff if you choose. So if you have the funds I think its smart to limit the spending initially. Couple key reasons for this are 1) you may get married later and then end up duplicate furniture items or your spouse may have different tastes in furniture and 2) You are likely to move later and your initial furniture purchases may not fit well or match the style of your housing later in life. Used furniture is one way to keep costs low. You can find a lot of good furniture for reasonable prices on Craiglist or at thrift stores. If you have some time to prepare for a move and acquire stuff then I'd strongly recommend shopping for used bargains first. When I first moved into my apartment when I got my current job I bought used furniture from a furniture rental store. The furniture was good quality and only slightly used. But a lot of people don't have the time to shop around for example if you get a job offer and you're faced with a cross country move to start a job in a couple weeks. 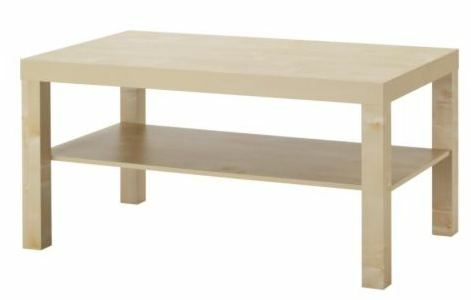 You can also get some pretty good new furniture at IKEA. If you don't have time to shop around for used stuff then this is a reasonable way to go. I've honestly never shopped at IKEA myself. But its one of the only nation wide chains that sells furniture and their prices are good. They seem to have a pretty good reputation but again I can't say with first hand. Of course you can pick your own choices in furniture to meet your personal preferences and needs for style and function. This is just an example list to demonstrate how you can relatively cheaply furnish an apartment with new basic quality items. One big negative about IKEA is that their furniture is almost all "assembly required". However if you shop around at many other places, this is not uncommon for cheaper furniture. I've had to assemble most of the furniture we've bought over the past few years. I got the data out of the BLS Consumer Expenditure Survey. They break down their numbers by income quintiles so thats a handy way to see some status broken down by income groups. 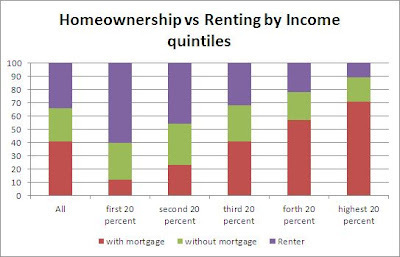 In general the lower income group folks are more likely to rent and the higher income people own more often. That follows from the simple fact that higher income makes it easier to buy and afford a home. Also, younger people are more likely to have lower income and less likely to have settled down and bought a home. So I figure some of this is correlated to age as well. I find it interesting that lower income people are more likely to own a home without a mortgage than higher income people. 28% of the people in the bottom quintile own a home without a mortgage compared to only 18% of the people in the top quintile. I would hazard a guess that this is due to lower income people owning homes through inheritance or gift more than not. Homes can be passed down from generation to generation and if you're lower income you're more likely to keep an inherited home, whereas higher income folks are more likely to go out and buy a more expensive home. But again, this is just my theory. 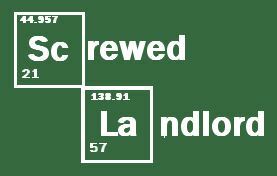 How Big of a Problem are Meth Labs for Landlords? One of my dad's biggest worries as a landlord is that someday one of his rentals will turn into a meth lab and he'll be "ruined" financially. He certainly has cause to worry. Meth labs are expensive to deal with. If you've ever watched the show Breaking Bad then you can imagine the kind of damage that a meth lab can create. However given where my dad lives and the realistic costs of clean up I honestly think he's worrying too much about meth labs. How bad of a problem are meth labs for landlords in general? That depends a lot on the situation and the risk vary greatly in different geographic regions. If you don't watch Breaking Bad then you may be unfamiliar with the concept. Meth labs are where individuals use a chemical process to create the illegal methamphetamine drug in their homes or elsewhere. The labs use toxic and dangerous chemicals that can be a serious health hazard and in rare worst case scenario could cause a violent explosion. The cost of cleaning up a meth lab involves hazardous waste disposal and complying with government rules. It seems to me that when people talk about meth lab cleanup costs they are relaying a worst case horror story or assuming that a meth lab would financially ruin any landlord. While these worst case scenarios can happen such that you literally have to demolish a building, that is not the typical scenario. Meth labs are expensive to clean but they are not going to cause you to demolish a building or drive you bankrupt. "DEA estimates that the average direct cost to clean up a lab several years ago was about $17,000, but is now $2,000 to $3,000 per lab." They also point out that : "There are additional ancillary costs associated with meth lab cleanup, such as property damage, reduced property value,.."
I would think the DEA would be a good source for this information. However costs can vary and individual cities and states may have different rules. So I figured I'd find a few more sources to see what they say. The METH Awareness And Prevention Project of South Dakota claims that "Averages $5,000 to clean up each lab, but costs can run as high as $20,000"
An article on the Tenant Screening Blog says "cleanup costs of $1,000 to $5,000 for each meth lab"
The Republic says :"That detailed procedure can cost in the thousands of dollars, approximately $3 to $4 per square foot. One local landlord reported that it took $40,000 to decontaminate one of his properties where police had found a meth lab operated by a tenant." Evansville Courier & Press says : "State law requires that a property be tested before its occupied again, which costs about $800. Subsequent cleaning by a licensed crew could cost about $8,000 and could take about two weeks." That gives us a sample of costs ranging from $1000 up to $40,000. It seems the typical average costs are closer to $2000 to $5000 level. Thats a pretty hefty bill for anyone. Don't expect insurance to bail you out either. It also doesn't cover things like loss of rent or the difficulty you may face in trying to rerent a former meth lab. How Common Are Meth Labs Really? In 2011 there were over 10000 meth labs busted in the USA. The DEA tracks Meth Lab Incidents over the years. The numbers vary drastically geographically however. Some areas like some of the Midwest have particularly bad problems and other areas see very few labs. It really depends on where you live. 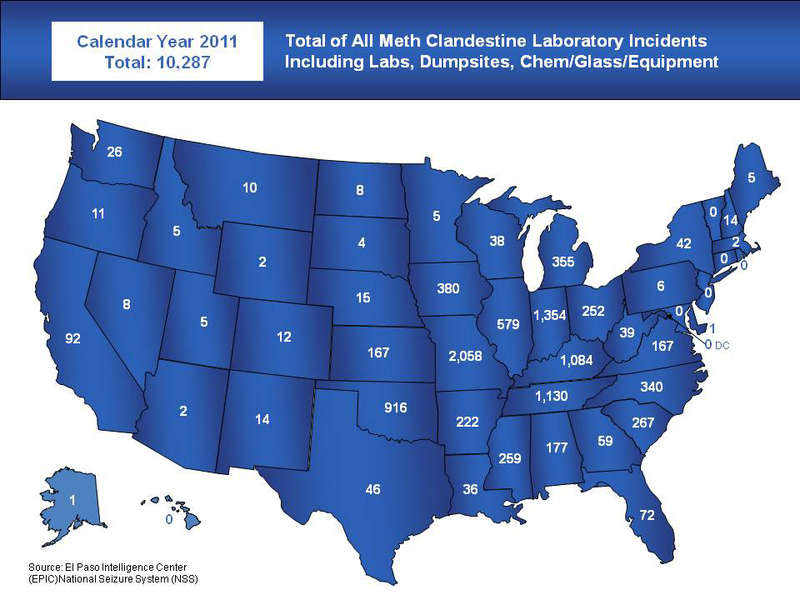 As you can see in the map above the vast majority of meth lab busts are in the Midwest and the South. The Northeast has many states with ZERO activity and the numbers in most of the West are relatively low. Missouri had the largest total with 2,058 incidents. With about 2.7 million households in the state thats almost 1 in 1000 homes were busted as meth labs and thats in just one year. On the other hand a state like Maine only had 5 meth lab busts across about 500k households so their rate is 1 in 100,000. Therefore you're probably 100 times more likely to encounter a meth lab bust as a landlord in Missouri as you would be in Maine. As I mentioned before you'll likely see other costs from a meth lab other than the direct cleanup. At minimum you're likely to experience a vacancy. Its also quite possible your former meth cooking tenants may leave abruptly in handcuffs with some unpaid rent. I doubt that meth lab cooks make very good tenants in general. The meth itself may only be part of the damage that the tenants do. You may have to legally notify prospective future tenants that drugs were manufactured in the residence as well, (check your local laws) and this could make renting the unit much more difficult and/or require a drop in rents. Of course this is all separate from the impact of the drug itself to the users which is extreme. Individuals who have a meth problem really need to seek Crystal-Meth treatment before it ruins their lives. First you should know the risks and be aware of it. Understand that the costs are always significant and can be gigantic. I think that not renting to known drug users is just common sense of course, but you should be careful in tenant screening. I wouldn't want you to stereotype people or subscribe to any vague bias about what kind of person would be a likely meth manufacturer. Instead employ solid screening practices to look for well qualified renters with good rental and credit history. You should also be vigilant and inspect your properties and look for warning signs. You should be aware of How to spot and report a meth lab. Bottom Line : Meth labs are a serious and expensive problem. Its quite unlikely an individual rental will end up a meth lab but landlords should be vigilant. How Common Are House Fires? How Much Are Peoples Homes Worth?